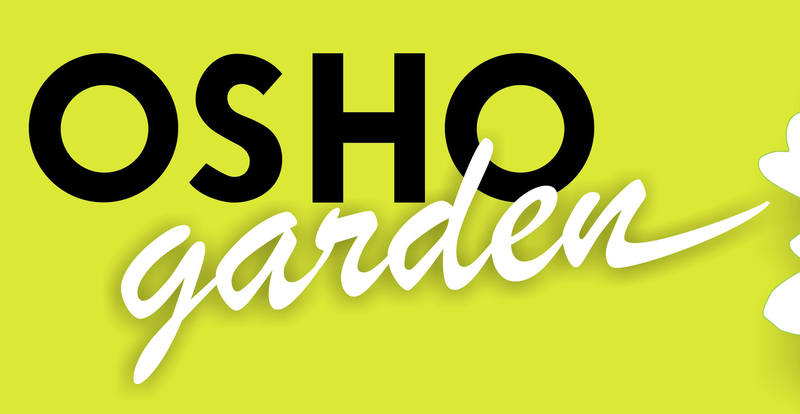 Postal address: Jardins de Lombos CP 270-A, 8400-411 Lagoa, Portugal. Telephone (landline) 00351 282 343 361. Our postal address is a mailbox placed at the main road, not at our house which is on an unnamed road. The name at our entrance gate is Jardins de Lombos / Lombos Gardens. The easiest way to find it is to put the coordinates in a navigation app on your smartphone and downlaod the map of Portugal so you can use it off-line. This will also help you in your free time to find your way to the many beautiful beaches and the coastal walking trail, and afterwards the way back to our house. You can also use the road map of the Lombos area below. You may want to print this map in order to show to a taxi driver or find your way on foot. You need to go to Jardins de Lombos – Lombos Gardens on the road map of the Lombos area. 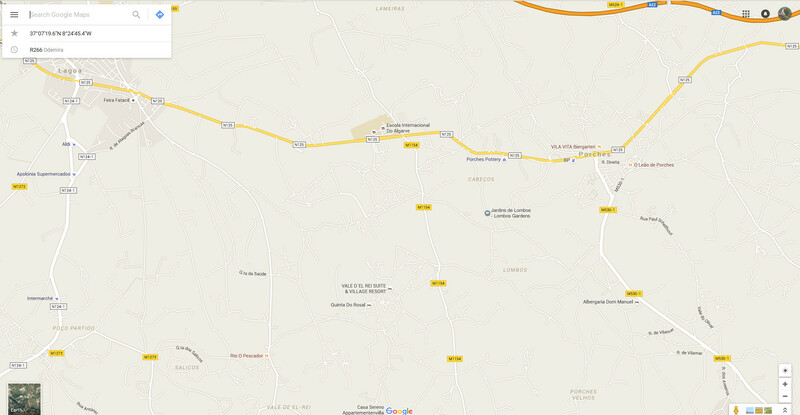 You can click on the map to enlarge (works also with pictures in our blog). And tell the taxi driver that he can get the directions in his navigation system by calling the Lagoa taxi central. If the taxi has no navigation system, you can tell the driver to go (from Lagoa) in the direction Porches. Before Porches he has to turn right, into a small road. This is about 300 m after passing the roundabout near the International School. After about 700 m there are some houses on the left side of this road. Enter the second entry gate, we usually leave it open when we expect people. 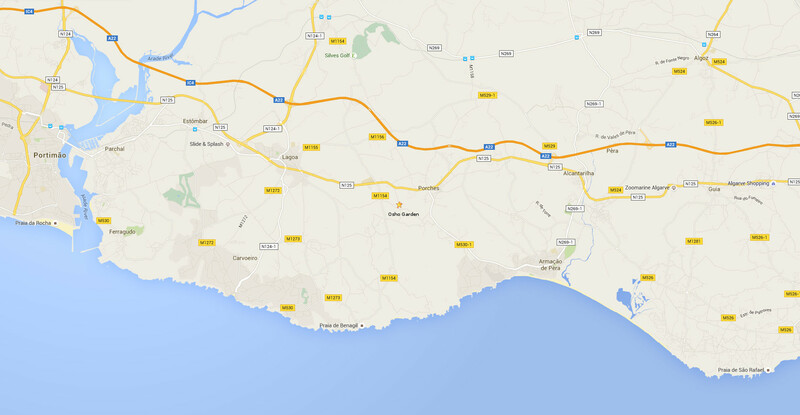 The nearest airport is Faro. We do not recommend to go by train as the station Lagoa-Estombar is 10 km from our house. You can get nearer with the bus to Lagoa (5km). In season (13 April until end of October) the best option is to book the Green Bus from Faro airport to our house for a fixed rate of 12 Euros (for a shared ride). Book a day in advance (in juli/august several days or they may be fully booked). Call 00351- 221 450 083 or book through the website: https://www.my-transfer.com/en/Ir-English_home. Select Faro airport to Lombos Garden, Lagoa. Get out at the Porches roundabout, walk on past the BP gas station and take the first left. There is an entry door near the letter L of Lombos Gardens on the map. got this contact from Julia in Penzance Cornwall. Sounds very interesting, please keep me informed of progress. Hey Jalanidhi! I put you on the mailing list. Pu. I almost bought a place in the same region myself last June..
And yes, I am a sannyasin and will provide osho-meditations where-ever I will “happen to live” in the coming years..
You are welcome to visit this place soon, I will keep you informed. Hoi Pujari, wil je mij ook op de mailinglijst zetten? Groeten, Sugit / Martin Schoenmakers, je weet wel, van Amsterdam. Succes met jullie project! I have been enjoying the blog very much, via Maarten. It sounds like a great project! Let me know if you want to visit us here to learn about permaculture or natural building, etc. We’d love to show you what we are doing. Hi Michele. Oregon is far too far for me at the moment, but thanks for the invitation. I put you on our mailing list. Great you are seeding now…. Harm is having his own farm, finally a community. Wishing you lots of laughs, blood, sweat and tears of joy! Second half of July, 2010, I am in that region of Portugal, with a camper. Is it already possible to stay on the campside. I would love to visit. It depends on what you mean by “visit”. Do you want to apply to participate? Beautifull step forwards in the NOW.. Please put me on your mailinglist. My heart tells me this is a very nice and needed project for those who reside in Osho’s silence. That’s right. And nice people like you are very needed here to help the project move forward, please come and join. Following the progress of your vision is like diving into a “bestseller-story”. 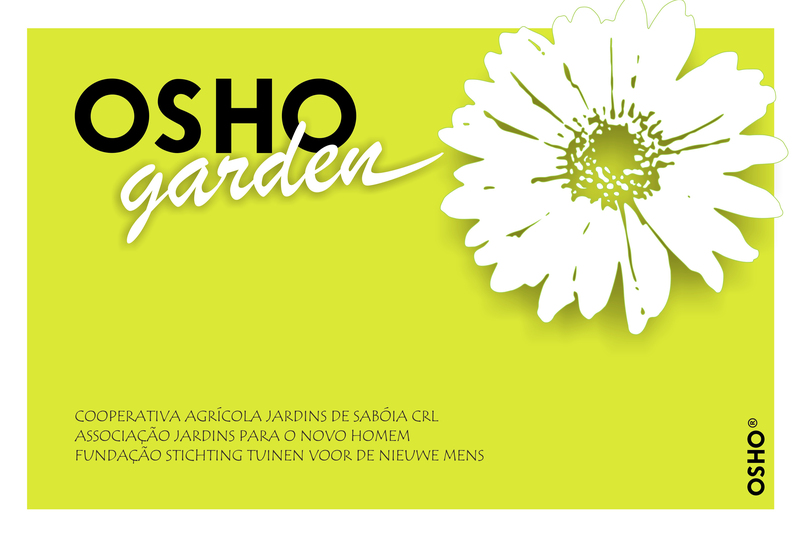 I would very much like to continue getting the informations fron Oshogarden. it would be good to maintain your newsletter..
looks all very bubbling with energy and joy, wish you all Osho’s-best…. and ofcourse I like to keep informed. You should see what you planted, it is turning into a bamboo forest! Ik werd via Baul (Amsterdam) geinformeerd over dit project. Ik lees dat men kan komen helpen, is het ook de bedoeling dat er mensen kunnen komen wonen? Hoe me op de hoogte! Wil je dat? Wat leuk! Kijk even onder How to join en neem contact op. Ik heb je op de mailing list gezet. Friends, this looks like a beautiful place. At the moment i’m in Ibiza in eco village and i got the information from Alex who came yesterday. In a few months i’ll come to visit. I was very happy to discover your project! Sou Portuguesa e estou a viver na california mas como vou brevemente a portugal gostaria de ir recebendo noticias, nomeadamente de eventos. é possivel? Hi Ana. Yes. You are welcome to visit us when you are in Portugal. And I added you to our mailing list. Olá, somos um casal de portugueses que pretende fazer uma visita à vossa quinta até ao fim do mês e, se possível, acampar e participar nalgumas actividades. Estariam disponíveis para nos receber? I fell in love with the area around Saboia and Nave Redonda five years ago. And now I am at the early stages of negotiating the purchase of a small plot of land. Hopefully it will come through, and I hope then to visit your place. I discovered your blog today and I have enjoyed reading about the adventure. I can feel the inspiration that you guys are generating. When I look for your community I remember when I stay in Oregon. Acabei de ver o vosso blog e gostei muito, estou interessada em fazer voluntariado na vossa Comunidade. O que é necessário fazer para participar/ajudar? I appreciate your beautiful project and also your Blog is done with a lot of care. I just have a problem that with the color scheme I can barely read the text. There is just too much green on the site. I would love to read more but it hurts in my eyes. Thanks for your appreciation Moritz, and sorry for troubling your color vision. We experience gardening and the color green as most relaxing and thatś why we chose this. The text is from a default template at WordPress and well readable on my screen, but the visibility may indeed be different on other computers. This is amazing, I am planning to go live in nature and meditate daily. I want to help with planting and participate in activities. Do you guys still welcome people ? Please contact me , and how long can someone stay with you ? Dear friends..we ester and sieds traveling now with our camper through portugal. We like to investigate the possibilities which can exist in the moment. To morrow we are in your neighberhood is it possibles to visit you ?